Black tea is one of the most beloved beverages in the world. From the Chinese to the British, black tea has become integral to cultural events, political summits, and everyday life. Drinking tea is a great way to unwind, but its chemical properties also boast an extensive array of health benefits. Black tea has been shown to protect heart health and may even prevent cancer. This healthy elixir is a delicious drink that not only taste great; it can also make you feel great. Earthy flavors entice taste buds while rich aromas soothe stress after a long day. 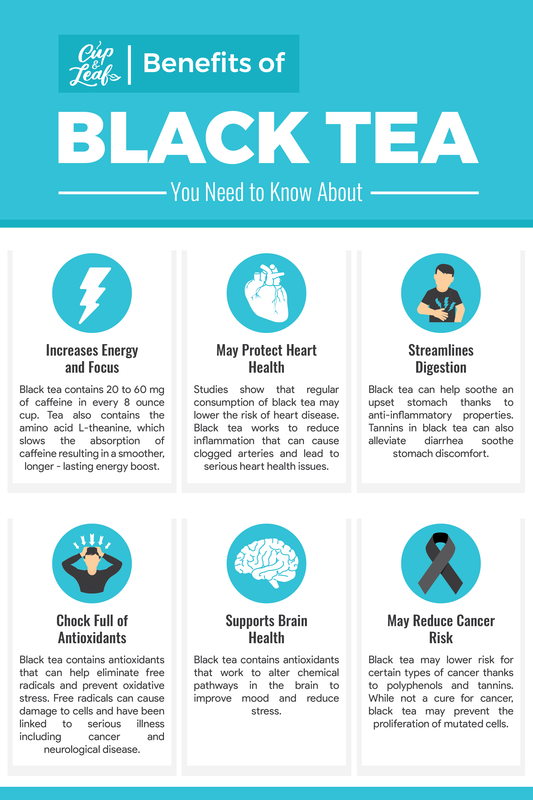 Read on to find out more about black tea and how you can incorporate this drink in your daily health regimen. 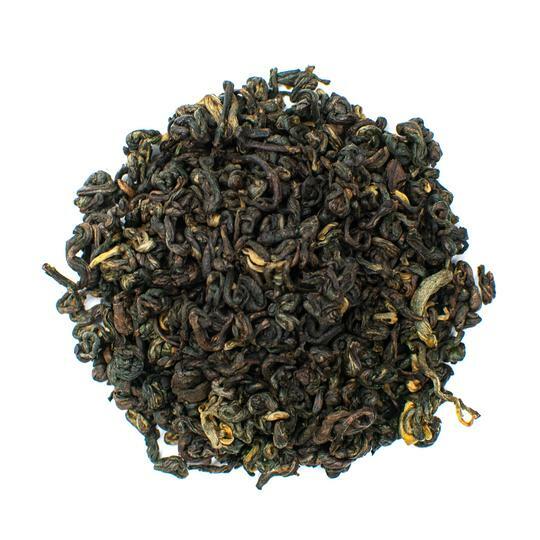 Black tea is a true tea like green tea, white tea, and oolong tea. That means it is made using the leaves of the tea plant known as Camellia sinensis. All the true teas come from the same exact leaves. They develop unique flavors due to the production process. 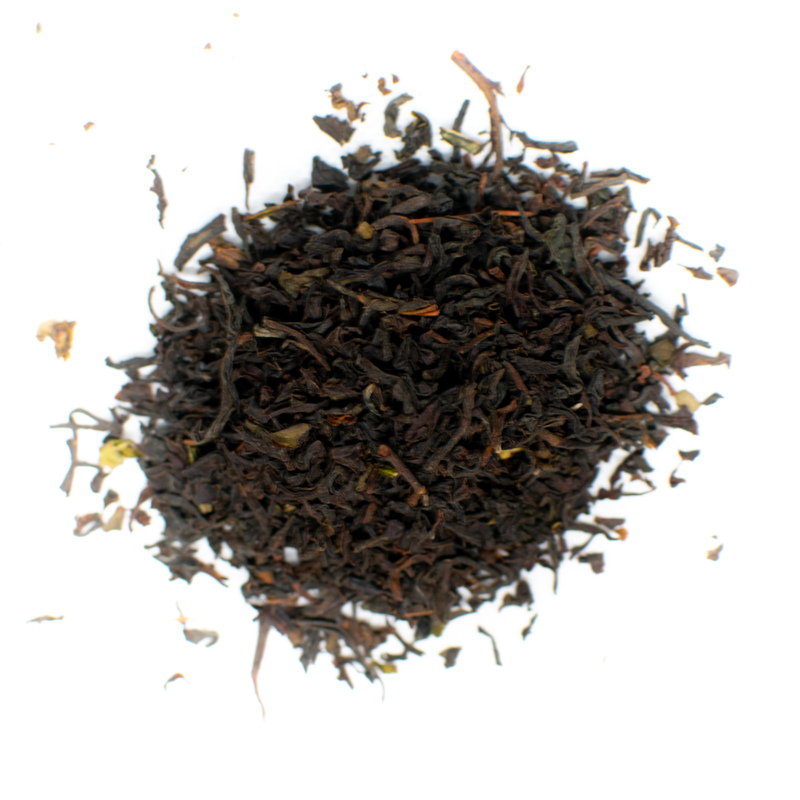 Black tea is the most processed of the true tea leaves. It is oxidized the longest and has the highest amounts of caffeine. The caffeine content of most black teas is about half of what you'd find in a standard cup of coffee. The tea leaves are harvested by hand and withered on large bamboo mats. One the leaves become limp, they are rolled into distinctive shapes and gently bruised. This releases enzymes that react with oxygen during the next step. Black tea leaves are then oxidized—a process where the leaves are exposed to air, resulting in the leaves turning a dark brown or black color. Once the leaves reach their peak, tea masters subject them to heat to prevent further oxidation. The leaves are the sorted and packaged for sale. Not sure which one to try? 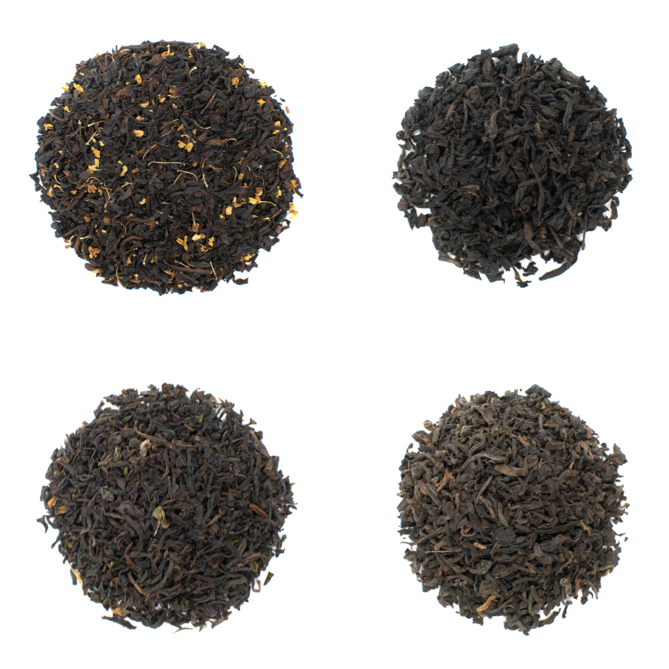 Check out our sampler of our four favorite black teas! There are many different types of black tea. The varieties are most often characterized by where they are harvested. 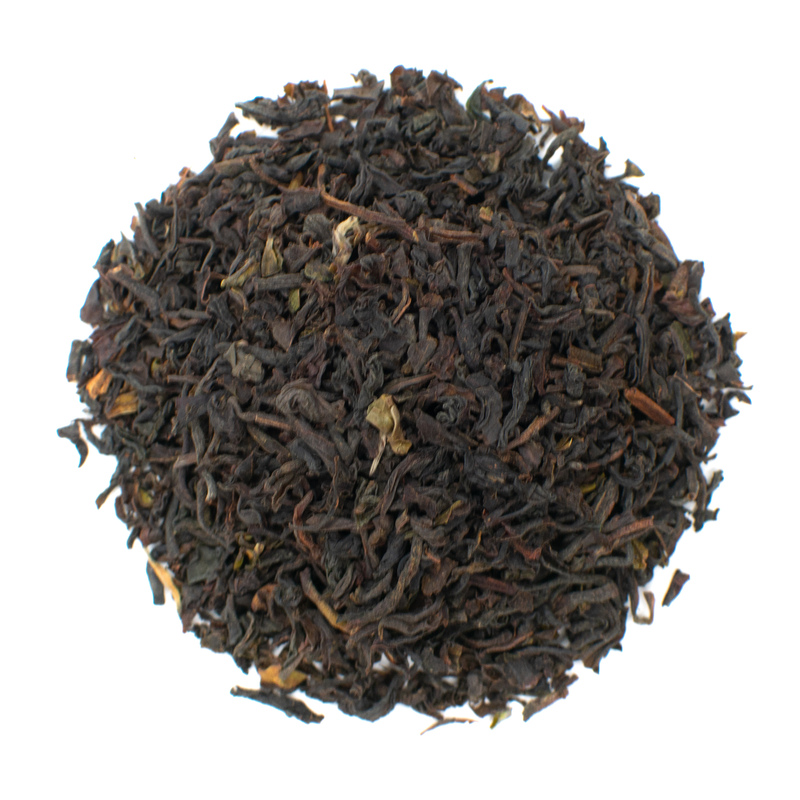 The most common black tea varieties include Assam and Darjeeling from India or Ceylon from Sri Lanka. Black tea is also a common base tea and wildly popular as a breakfast tea. 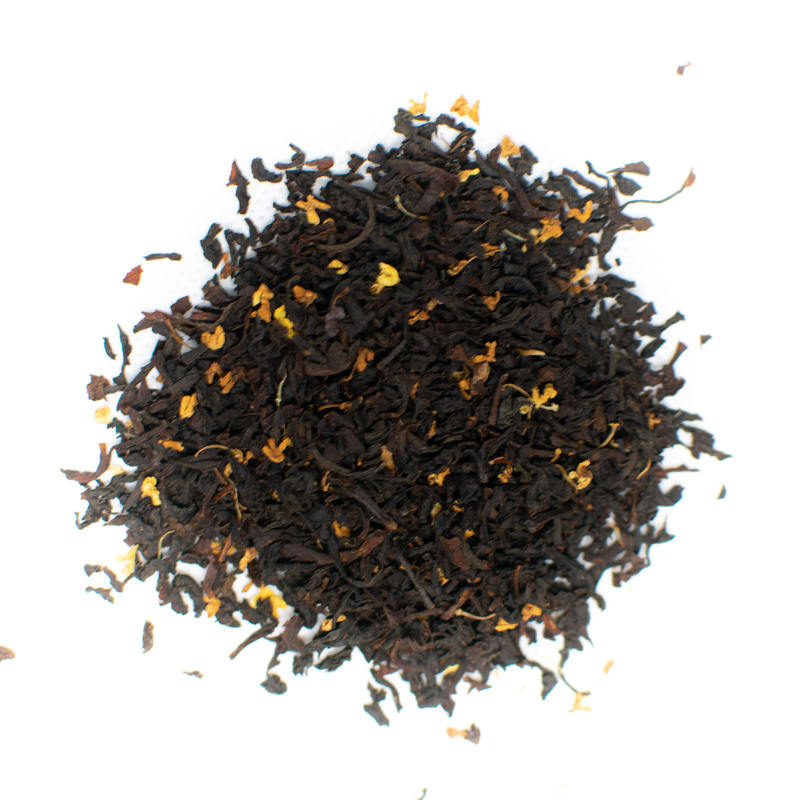 Earl Grey is a English black tea that is infused with bergamot for a citrusy flavor. In general, black tea is one of the stronger tasting teas out there. It has a strong, rich flavor that is often compared to a mild cup of coffee. The flavor of any particular black tea depends largely on where it was grown, how it was harvested, and how it was produced. Black tea flavors range from savory to sweet and can be malty, smoky, earthy and nutty. Some blends feature notes of citrus, caramel, and honey and they can range from amber to dark brown in color. The National Cancer Institute lists several trials and studies that demonstrate the potential of tea in cancer prevention. Black tea contains high concentrations of antioxidants known as polyphenols. These compounds have been linked to a lower risk of certain types of cancer. The most powerful of these antioxidants is known as EGCG or epigallocatechin gallate (1). A study published in Anticancer Agents in Medicinal-Chemistry found that this antioxidant protects cells from mutations that can cause cancer. The EGCG was also able to induce the death of cancer cells under certain conditions. Research shows that black tea is most effective in cancer prevention of breast cancer, ovarian cancer, and lung cancer (2). A second study published in the European Journal of Cancer found that tea polyphenols known as theaflavins may prevent the spread of breast cancer cells. 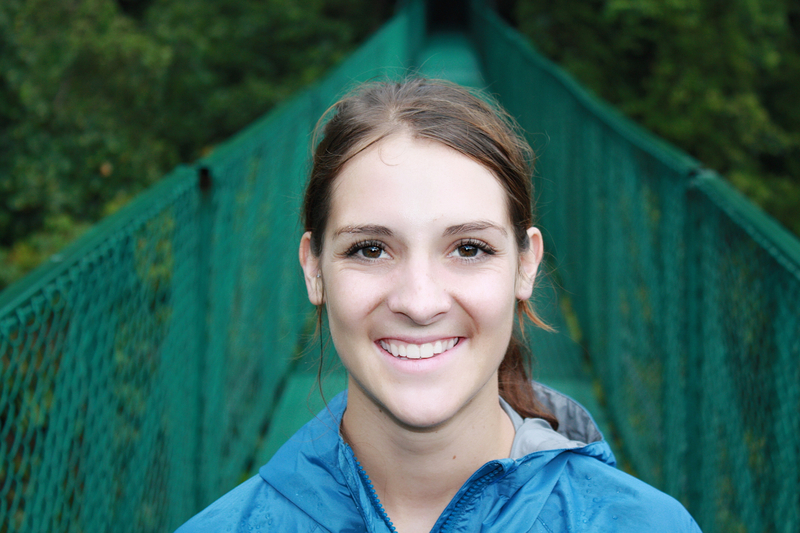 The study was conducted in vivo and in vitro using both rat and human cancerous cells. The research showed theaflavins work on a cellular level to prevent the reproduction of cancer cells and the growth of tumors (3). Drinking black tea should not be considered a replacement for standard cancer treatment. When combined with a healthy lifestyle, it may help prevent cancerous cells from forming or reproducing. More research is needed, but so far black tea has shown potential health benefits when it comes to cancer prevention. 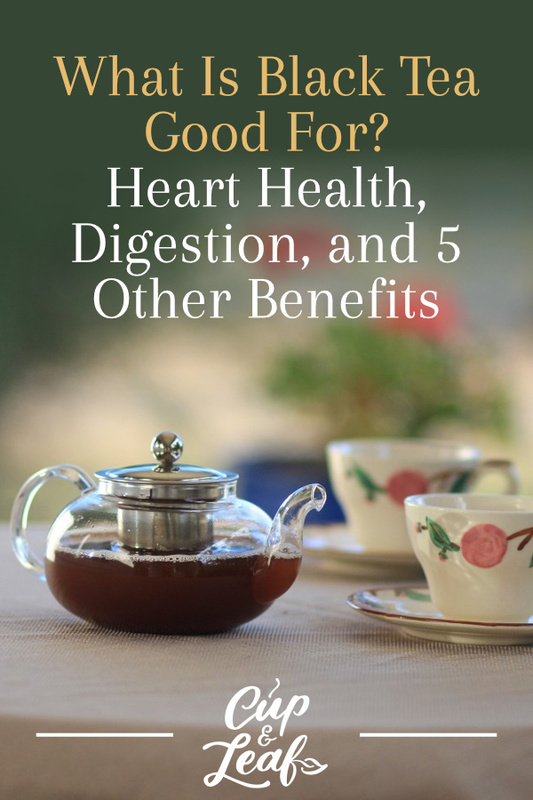 One of the most recognized tea benefits is its ability to protect heart health. Studies have shown black tea may help prevent stroke and can also lower cholesterol levels. Black tea may help protect against heart disease by lowering high blood pressure. Drinking tea daily may help to prevent heart attack and other cardiovascular diseases. Research published in Preventative Medicine studied the effects of black tea on blood pressure. The randomized, controlled trial consisted of an experimental group that consumed black tea 3 times per day for 12 weeks. Results were compared to a placebo group that drank only hot water. Black tea was shown to reduce blood pressure and triglyceride levels in patients. Black tea decreased levels of bad cholesterol known as LDL cholesterol by 16%. It also increased levels of good cholesterol or HDL cholesterol by 20% (4). Another review published in the European Journal of Clinical Nutrition examined the research on black tea and heart health. Researchers analyzed clinical trials published from 1990 to 2004. They discovered clear evidence that long-term consumption of black tea helped to lower the risk of heart disease. The minimum effective dosage was found to be 3 cups of black tea per day (5). A meta-analysis published in Stroke analyzed the ability of black tea to prevent stroke. Researchers analyzed data from 9 separate studies involving close to 200,000 participants who experienced fatal or nonfatal strokes. The review found that people who consumed at least 3 cups of black tea per day had a 21% lower risk of stroke than those who consumed less than 1 cup per day (6). Black tea has shown powerful effects when it comes to preventing the conditions that can lead to type 2 diabetes. High blood sugar levels can cause diabetes as well as other diseases such as cardiovascular disease, obesity, and kidney failure. In America, a sugary diet has increased the rates of diabetes over the last decade (7). Consuming black tea may help to lower blood sugar levels, resulting in a lower risk of diabetes. The problem with sugar boils down to how the body stores and reacts to eat. When you eat sugar, your pancreas releases a hormone known as insulin. Insulin transports the sugar to muscles where it is converted into energy. The problem arises when you eat too much sugar. Excess sugar is stored as fat and high consumption of sugar can cause insulin resistance and other problems. Research shows that black tea may enhance the body's use and tolerance of insulin. A study published in the Journal of Agricultural and Food Chemistry explored these effects. Tannins, EGCG, and theaflavins were found to increase insulin-potentiating activity 15-fold (8). A second study found that black tea extract helped to promote the secretion of insulin. This may help diabetic individuals who have difficulty producing and tolerating insulin (9). Black tea is a popular beverage during meal times in Asia. Traditional medicine has argued that tea helps to streamline digestive processes and alleviate digestive problems. Black tea may help prevent bacterial growth that causes ulcers and can help alleviate symptoms such as diarrhea. A study published in Food Reviews International investigated the effects of black tea on digestive tract health. Results showed that black tea helps to promote the growth of healthy bacteria while inhibiting the proliferation of bad bacteria (10). Black tea was particularly effective in preventing Salmonella and Helicobacter pylori that is responsible for stomach ulcers. Black tea can also help soothe an upset stomach and diarrhea. Black tea contains compounds known as tannins that have an astringent effect. This helps to reduce inflammation and irritation that can cause bad bowel movements. A study published in the Journal of Evidence-Based Complementary and Alternative Medicine examined the effects of black tea on diarrhea in 60 patients between 2 and 12 years of age. The randomized, controlled trial found that black tea exhibits antidiarrheal properties and helps to soothe stomach discomfort (11). Black tea contains large amounts of antioxidants that help to improve overall health. Antioxidants work to eliminate free radicals that can cause damage to the immune system and other body processes. Free radicals are toxins caused by environmental factors such as pollution. They can also be caused by an unhealthy diet and smoking. Free radicals cause damage on a cellular level and have been linked to cancer and other diseases. Tea antioxidants flush these toxins from the body. Black tea is considered one of the most caffeinated teas. It can give you an extra boost of energy in the morning to start your day or power you through an afternoon slump. Black tea also contains an amino acid known as L-theanine. This amino acid helps to deliver caffeine more smoothly. That means you won't have the classic spikes and drops associated with coffee consumption. A scientific review published in Nutrition Reviews examined the use of black tea in increasing energy levels. Researchers discovered that the combination of L-theanine and caffeine in black tea enables higher focus and a better ability to avoid distraction. Study participants found that energy and alertness lasted longer and was smoother than that provided by caffeine (12). Blend our English Breakfast Black Tea with milk, lemon, and a sprig of mint to start your day. 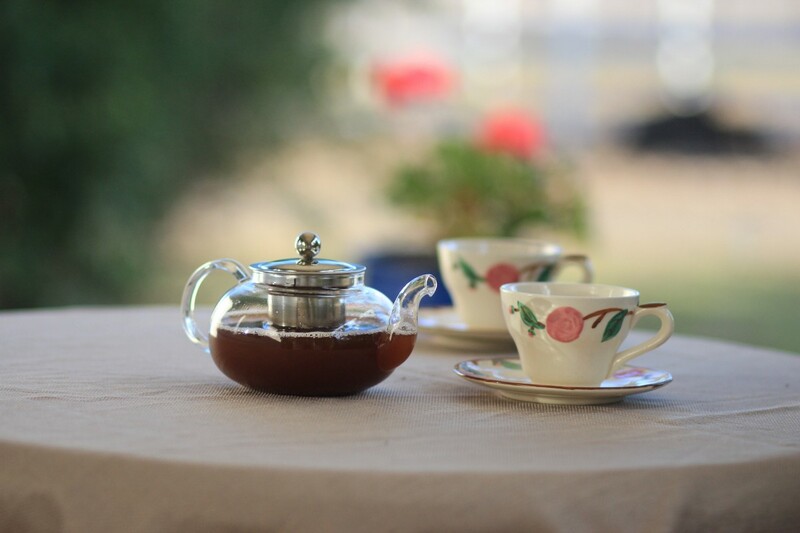 A second study published in Appetite investigated the effect of black tea on attention. Researchers conducted two randomized, double blind, placebo-controlled studies. Participants consumed black tea made from tea bags or a placebo created from colorings and flavorings. The participants who consumed black tea performed better on tests analyzing the ability to switch between tasks. They also demonstrated higher levels of auditory and visual attention when compared with the placebo (13). 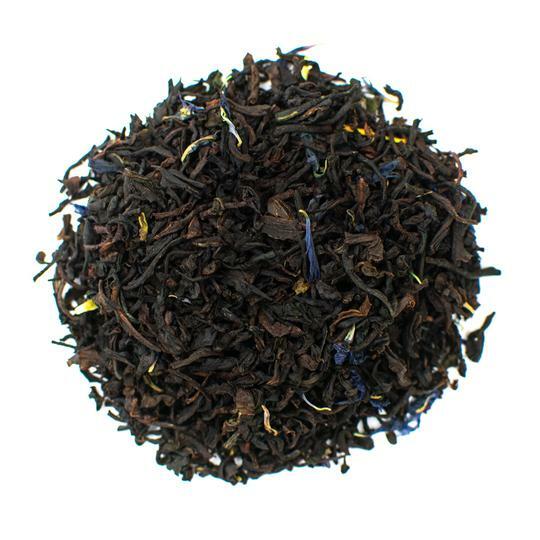 Our English Breakfast Black tea is a classic favorite! Blend it with milk, lemon, and a sprig of mint to start your day. Daily black tea consumption may help protect the brain from degenerative neurological diseases such as Parkinson's disease and Alzheimer's. These effects are due to the high concentration of antioxidants in black tea. Drinking tea can also help to reduce stress and prevent psychological diseases such as depression. 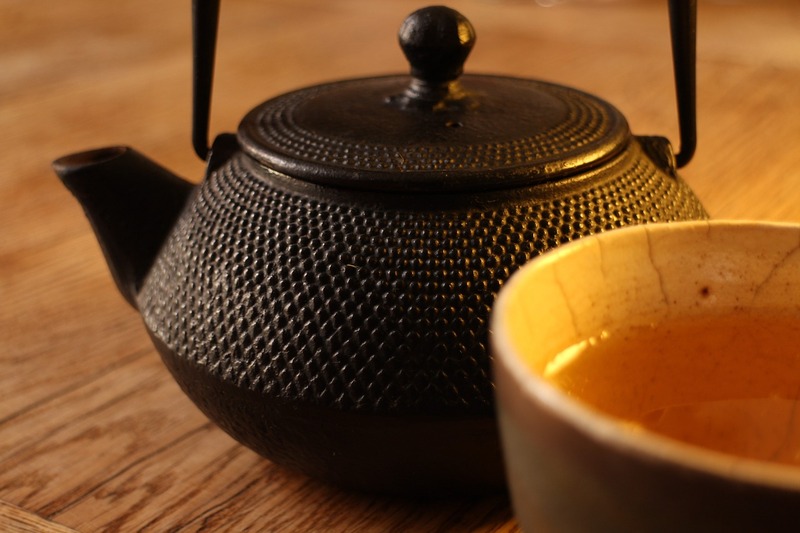 A study published in Psychopharmacology examined the effects of tea on stress levels. The randomized, double blind study consisted of 75 healthy participants who drank black tea for a period of 6 weeks. The experimental phase was followed by a 6-week placebo phase. Participants demonstrated significantly lower levels of cortisol during the tea phase of the trial. Cortisol is the human stress hormone that can cause feelings of anxiety and restlessness. Participants also felt more relaxed when they consumed black tea—even when exercise elevated their heart rate (14). Black tea has very few side effects when consumed in moderate amounts. Drinking more than 4 to 5 cups of black tea per day may result in negative side effects. This is largely due to the caffeine content of black tea. Excess amounts of caffeine can cause headache, irregular heartbeat, nausea, and anxiety. Choose a decaf black tea if you are sensitive to caffeine or want to drink several cups per day. Is Black Tea Good For You? Black tea is one of the most consumed beverages in the world. It's bold flavor makes it a popular alternative to coffee. Black tea leaves offer the most health benefits since they consist of the full leaves. Tea bags contain broken leaves,, dust and, fannings from black tea leaves and don't always offer the same quality when it comes to health. 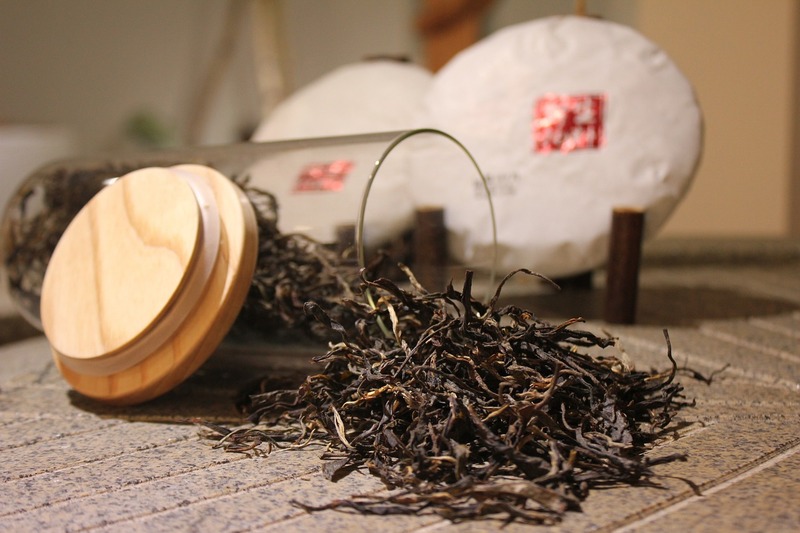 Stick to brewing your black tea with high quality leaves whenever possible. Enjoy delicious bold flavors and drink black tea to improve your health.